Nurturing a donation is unlocking a donor’s desire to express their joy for caring for others. There are many reasons why donors give. But if you look at the core reason why donors give, for many of them, it comes down to a feeling of joy. Donors give because they are filled with joy. How do you get more donations? Fill more donors with a sense that donating will bring them joy. First, express gratitude to your donor. You can create more second donations by the simple act of saying “thanks” than almost anything else you do. 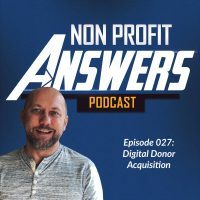 Unfortunately, few nonprofit organizations adequately thank donors. For many donors, this is the biggest barrier to giving again: the nonprofit they gave to didn’t demonstrate they care. Second, tell better stories. Your stories of need should be written to open a story loop that the donor can close. Here’s what I mean: a story loop is a complete story from beginning to conclusion. When you leave a story loop open, the reader is left needing fulfillment. You naturally want a story to close, to come to conclusion. By opening a story loop in an appeal, you allow the reader to close it by donating. Finally, show the donor what their donation did through impact reporting. If someone donates and you never tell them the good they accomplished, they are less likely to give in the future. Impact reporting brings joy to the donor. The donor cares about the beneficiaries of your organization. It brings a donor joy to see a life changed or a circumstance improved. Help the donor feel that joy!